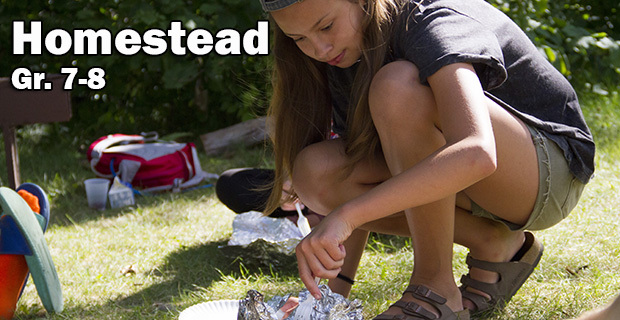 A camp week like no other at Camp Metigoshe—Homestead camp will be an unforgettable, 3-day, wilderness-camping experience and a milestone in your faith journey. A cool part of this week is that you will live with a small group of campers away from main camp in a log cabin at the Homestead site, prepare your own meals, explore the outdoors, and explore your faith. Nobody wears a watch, so you may play, pray, sleep, and eat as you like. This will be an amazing adventure, whether it is your only time at camp or a second camp experience. Register early because the maximum number of campers is limited to 20. Sign up soon! Camp begins at 5:00 pm on Sunday and concludes at 7:30 pm on Wednesday.